Smart Inspection Systems: Techniques and Applications of Intelligent Vision will enable engineers to understand the various stages of automated visual inspection (AVI) and how artificial intelligence can be incorporated into each stage to create "smart" inspection systems. The book contains many examples that illustrate and explain the application of conventional and artificial intelligence techniques in AVI. 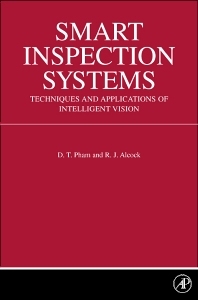 The text covers the whole AVI process, from illumination, image enhancement, segmentation and feature extraction, through to classification, and includes case studies of implemented AVI systems as well as reviews of commercially available inspection systems. Each chapter concludes with exercises. This book will be of interest to users and developers of commercial industrial inspection systems as well as researchers in the fields of machine vision, artificial intelligence and advanced manufacturing engineering. Automated Visual Inspection and Artificial Intelligence. Image Acquisition and Enhancement. Segmentation. Feature Extraction and Selection. Classification. Smart Vision Applications. Industrial Inspection Systems.